Horses can suffer from minor irritations, grazes and cracked skin all year round. 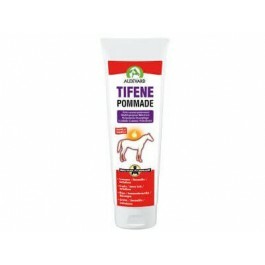 The Tifene Pommade formula combines three essential oils with an oily base, providing skin protection against environmental stresses such as water, dust and insects. A must-have in all grooming kits! Composition:Flower of sulphur, zinc oxide, boric acid, chlorhexidine, geranium (Pelargonium graveolens—EO), lemongrass (Cymbopogon citratus—EO), tea tree (Melaleuca alternifolia—EO). Instructions for use: Clean and dry the concerned area before applying a thick layer.